Through the looking glass and beyond: studies of parasitism, immunity, and ecology of dragonflies. Much ink has been spilled about co-evolutionary interactions of parasites and their hosts. 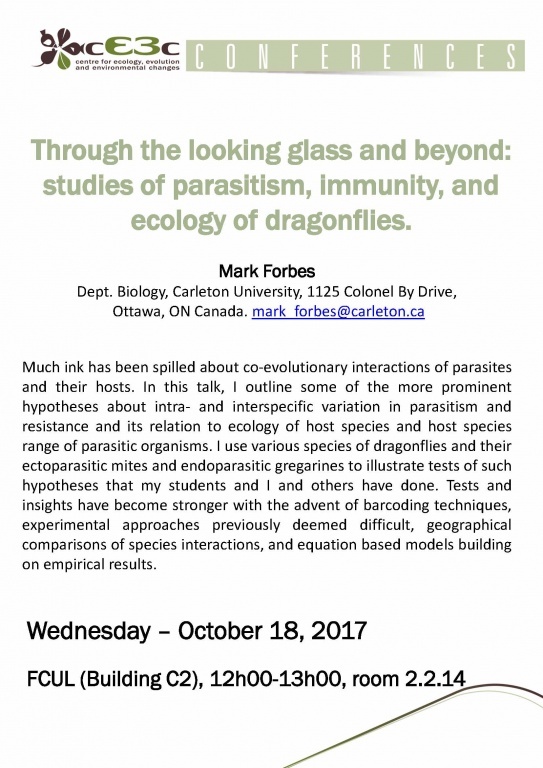 In this talk, I outline some of the more prominent hypotheses about intra- and interspecific variation in parasitism and resistance and its relation to ecology of host species and host species range of parasitic organisms. I use various species of dragonflies and their ectoparasitic mites and endoparasitic gregarines to illustrate tests of such hypotheses that my students and I and others have done. Tests and insights have become stronger with the advent of barcoding techniques, experimental approaches previously deemed difficult, geographical comparisons of species interactions, and equation based models building on empirical results.